In General category, a checklist is provided to the respondents in which they can check/uncheck the options and configure the quiz, accordingly. Before the checklist starts, the respondent has to enter the quiz name. Checked: The option will be visible during the quiz. Checked: Logo shall be displayed when the option is checked. Checked: Page titles shall be displayed during the quiz. Unchecked: During quiz, no page title shall be displayed. *Note: Respondents will have the option to return and complete the quiz at some later time. Checked: Respondent will save time and start it later on. Unchecked: Respondent will have to complete it on the same time. ***Note: Respondents will only have the set time to complete the quiz. Checked: When the option is checked, time limit is set. Unchecked: There shall be no time limit. *Note: If set to greater than 1, respondent will be able to take the quiz up to the value set. 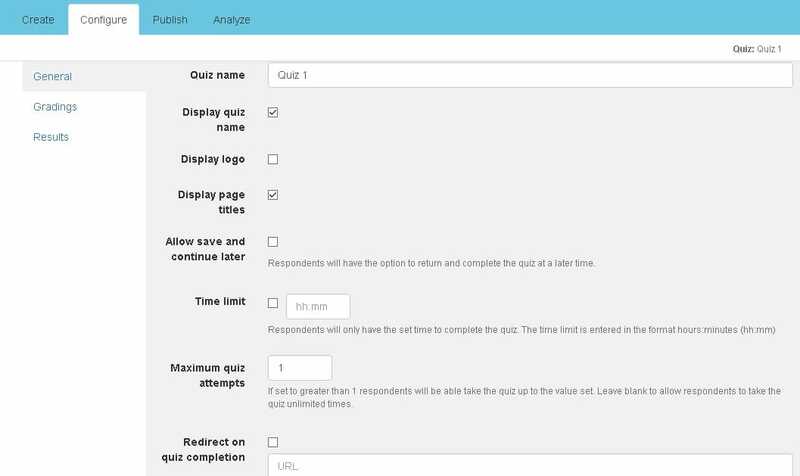 Leave blank to allow respondents to take the quiz unlimited times. Checked: Allows the respondent to set the limit for quiz. *Note: Respondents can add URL in the text file to redirect to another website. Checked: Enable respondent to move towards next website. Unchecked: Respondent will stay on the same page.